Tyr is a god in Norse mythology. In the Eddas, he is either the son of Odin or Hymir. He is the god of single (man-to-man) combat. Tyr only has one hand. At one point in time, the gods decided that the wolf Fenrir (also called Fenriswolf) could no longer go free. They wanted to lock him up onto a chain. But he broke every chain they tried to put on him. Finally, they had the dwarves make a magical chain. But Fenrir sensed what the gods would do. So Fenrir asked that one of them put his hand into his mouth. Knowing that if Fenrir was left unfettered, he would have grown strong enough to kill all the God's and destroy the world. Tyr was the only one who had the courage. When Fenrir sensed he had been tricked, he bit off Tyr's hand. Tyr remained handless forever. Fenrir will remain bound until Ragnarök. 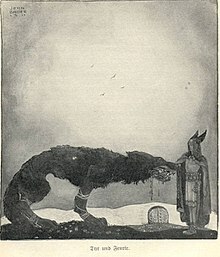 Then, Tyr's opponent will be Garm, the guard dog of Hel. This page was last changed on 15 April 2018, at 23:58.